We’ve heard for years that there is a possible connection between brain cancer and cell phone use, and lately it has been suggested – especially in social media – that sleeping with a cell phone under your pillow is especially dangerous. Is this true or merely an exaggerated online rumor? Most experts agree with the warnings to avoid sleeping with a cell phone under your pillow. The “under the pillow” angle of cell phone radiation is just a subset of a larger discussion on the topic of cell phone radiation in general. Though there is some evidence to support harmful effects of cell phone use on the brain, the jury is out on brain cancer or brain tumors and cell phone use. Nevertheless, most experts advise taking the safe route and limiting unnecessary extended exposure, such as sleeping with a cell phone next to your head. Some people are so attached to their cell phones that they sleep with them on their nightstand or even under their pillow. Bad idea. Cell phones pump out electromagnetic radiation whenever they’re on – which means sleeping with one nearby boosts your exposure all night long. What to do? Put the phone on “airplane mode” (which shuts down the transceiver) or turn it off. If you need to be available for calls, place the phone several feet away from your bed. 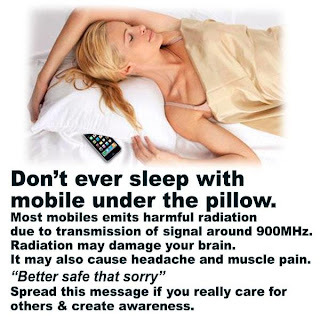 Avoid sleeping near a cell phone that is on. It has been reported that an alarming number of kids sleep with a live cell phone under their pillow and text their friends in the middle of the night. This is extremely dangerous! …parents not allow their children under the age of 18 to use mobile phones except in emergencies, or to sleep with cellular phones under their pillows. Joel Moskowitz, PhD, director of the Center for Family and Community Health at UC Berkeley’s School of Public Health has suggested that it is best not to let kids sleep with their phones under their pillows and advises against carrying cell phones in front pockets, due to possible radiation exposure to the reproductive system. In 2011, a Thailand consumer protection group issued a warning, urging people to stop sleeping with their cell phones. From the sampling above, it would appear that most experts suggest avoiding sleeping with cell phones under your pillow, especially until more is known about the connection between cell phone exposure and brain tumors. Keeping cell phone several feet away while sleeping. Using speaker instead of talking directly into the handset. Use headphones or Bluetooth connectors. If you are using your phone at night for its clock or alarm features, consider putting it in “airplane mode” which suspends the phone’s transmission functions. How Safe Is Your Deodorant?